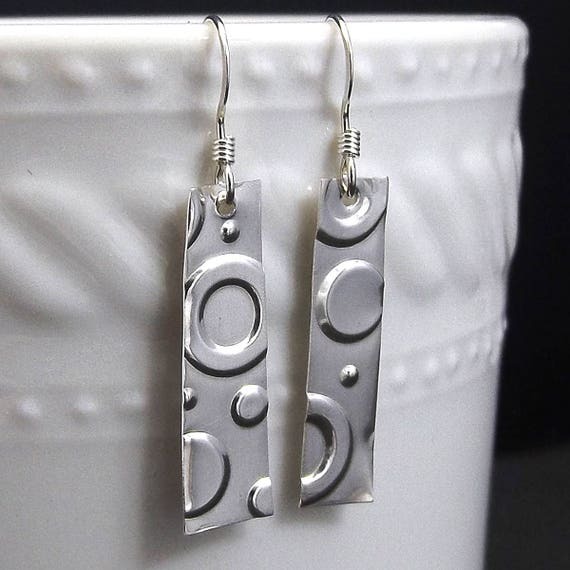 The universal symbol of wholeness, timelessness, perfection – this circle patterned set of sterling silver rectangle dangle earrings is everything you need to complete your next casual look. Circles are always in, and earrings are no exception. This pair will become a favorite in your jewelry box. These cute dangling silver rectangular earrings measure 0.25 inches in width and 1.5 inches in length. Each earring is handmade by me in my North Carolina Studio using a metal embossing technique that creates the shapes and patterns seen on these earrings. Comments and questions are welcome. Spammers will be deleted and banned from this site. Copyright Eluna Jewelry Designs 2007-2018. Awesome Inc. theme. Theme images by merrymoonmary. Powered by Blogger.